Every medical malpractice case is different, to be sure. In the state of Indiana, the process by which a patient seeks compensation for injuries suffered when healthcare providers fail to offer proper care begins with a proposed medical malpractice complaint filed through the Indiana Department of Insurance. The reason: all malpractice claims against a qualified provider must be reviewed by a medical review panel before the claim can be filed in court. This week, the law firm of Ramey & Hailey filed just such a proposed medical malpractice complaint against three medical practitioners and against Community Health Network, along with a complaint in Indiana State Court against Community Hospital East…. It took all of three doctors and all of fifteen days for S.C. to lose her eye because of a misdiagnosed infection…. The sad saga began two years ago when S.C., experiencing blurred vision in her right eye, consulted family practitioner Dr. B. The doctor diagnosed her condition as a combination of conjunctivitis (“pink eye”) and pneumonia and prescribed a Z-pack, with no follow-up visit scheduled. Two days later, on a Friday, S.C. realized she had no vision whatsoever in her right eye, and immediately proceeded to the emergency room at Community, where she was seen by a Dr. V. No treatment was offered, but during the visit, a phone consult was arranged with an ophthalmologist named Dr. L. That physician, despite being the specialist on call, failed to come to the hospital and he recommended no treatment or further testing of S.C.’s condition. The condition kept worsening, and four days later, S.C. was admitted to Eskenazi Health Hospital, where the diagnosis given was endophalmitis (an infection of the aqueous and vitreous materials that make up the inside of the eye). Finally, after five more days, S.C.’s right eye had to be removed due to the extent of her infection…. The medical treatment given the plaintiff fell below an accepted standard of care, and, as a result, S.C. suffered permanent and life-changing injury. An experienced personal injury attorney is an invaluable asset in any medical malpractice lawsuit. 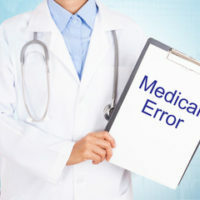 Because medical care is such a technical and highly specialized field, expert testimony is required to establish a connection between the actions – or failure to act – of medical practitioners and the injury suffered by the patient. © 2014 - 2019 Ramey & Hailey, Attorneys at Law. All rights reserved. Custom WebExpress™ attorney website design by NextClient.com.